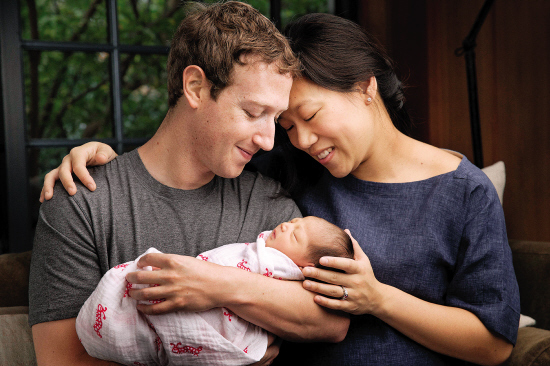 Facebook founder Mark Zuckerberg wrote a letter to his baby girl, Max, on Tuesday. He wants her "to grow up in a world better than ours today." Zuckerberg wrote that he and his wife, Priscilla Chan, would donate 99% of his Facebook stock shares, worth about $45 billion, to do just that. Even with the large donation, Zuckerberg will remain extremely rich. After the news came out, Zuckerberg was one of the most searched names on Google. His Facebook post received more than one million likes. Mark Zuckerberg and Priscilla Chan announced they had a baby girl and will donate the majority of their Facebook fortune to charity. Well-known people like Shakira and Arnold Schwarzenegger also gave the thumbs-up. Financial analysts say it is a good move to prevent the shares from being taxed when they are sold. The shares will be donated to the Chan Zuckerberg Initiative over Zuckerberg's lifetime. Zuckerberg and his wife, Chan, head the organization, of course. That is why a video posted by Dr. Robert Hamilton of California received 1.7 million views in its first day on YouTube. Hamilton has been practicing this technique on babies he sees in his practice for 30 years. He calls it "The Hold." First, fold the baby's arms gently over each other, and hold them with your left hand. Next, hold the baby's bottom with your right hand. Then bounce the baby gently while holding it at a 45-degree angle. In Hamilton's video, the babies become calm after just a few seconds. Koreans were the big winners at Wednesday night's Mnet Asian Music Awards. EXO, a boy band made up of South Korean and Chinese singers, won for Male Group of the Year. Big Bang, another South Korean band, won Artist of the Year and Song of the Year awards. Big Bang also won Worldwide Favorite Artist behind their album "Made" and Best Music Video for their song "Bae Bae." The hashtag #MAMA2015 was used more than 2.1 million times in just a few hours as the awards show was broadcast around the world from Hong Kong. He later sold his original stock shares and made a considerable profit. The words had come out without forethought. 1.Mark Zuckerberg and Priscilla Chan announced they had a baby girl and will donate the majority of their Facebook fortune to charity. The majority of patients have vague abdominal pain or discomfort. 2.EXO, a boy band made up of South Korean and Chinese singers, won for Male Group of the Year. foldn. 折层，折痕 vt. 折叠，包，交叉，拥抱 vi.